A conversation I was having with a student today reminded me of the importance of that unpopular, old-fashioned idea of ‘evangelism’. The conversation headed in the direction of a belief that people of the far-right, hate-mongers and suchlike, should be stopped from assembling. I expressed my belief that no speech, excite incitement to violence, should be outlawed. I feel this way partly out of a concern that if they stop the racists from speaking and assembling, who will be next? And when will they come knocking on Father Raphael’s door? I also expressed, in the course of this conversation, my belief that the problem isn’t legislation but the human heart. You can’t legislate evil away. And so my thoughts about the need for mission arose from this context in two main ways. First, how can we speak the truth of Gospel into a culture that thinks ‘dangerous speech’ should be banned? Second, how can we, as Christians, actually see the transformation of the wicked human heart that we all desire? I no longer know the answer to the first, for I have grown frozen in speaking Gospel. The second relates to actually making disciples, so is related to the first. Nonetheless, I was reminded of the need to bring the Gospel to a hurting, broken world. And all of this ties into the title of this post because I sometimes get a feeling from some corners of the Interwebs that Christians can be drawn into the mystical, contemplative, liturgical traditions of the Church as part of a reaction against some of the spiritual toxicity that is out there in some parts of evangelicalism. And what I feel like I see sometimes is a retreat not simply from things like politics (which may be a good thing) but from God-talk altogether. Christian spirituality becomes therapy for me, and is spoken of as therapy for a broken world, but without actually engaging in the dreaded discipline of talking to other humans about the Gospel and God of grace, how are we really healing that broken world? I am guilty of this to some degree, although I resist ‘mysticism as therapy’ as best I can. My theory has always been that if we engage in spiritual disciplines, we will love God more, look like Him more, and be more comfortable as who we are. As a result, we will be able to speak Gospel to a broken, hurting world, a world that includes both racists and those who want to legislate against dangerous speech. Question: Can someone give me evidence of this working for them? I realise I’ve just mixed metaphors, but I hope you don’t mind. In response to my post about how I’m having trouble getting things rolling again, I got some good tips and refreshing perspectives. Keep the bike upright is one of them. As someone who cycles to work, I understand that. Momentum is necessary, you need to keep pedalling. But how to keep pedalling? Well, I need to realise that part of the martyrdom of parenthood is not having the free time to pray all the offices. But that’s okay — taking care of my son, my household, is an act of love, and is itself part of the disciplined life. Thus, a little twist on the Benedictines — ‘laborare est orare’. As I’m working through what disciplines I can reasonably and prayerfully engage, I’m also reading Lisa Deam, A World Transformed. This book is ostensibly about the spirituality of medieval maps. But a lot of it is about pilgrimage, and the pilgrimage of the heart. We are all headed to Jerusalem, to the heavenly city. Along the way, we need to watch out for the many perils on the road. Robbers, thieves, hunger, thirst, cold, shipwreck when sailing from Venice, snow in the Alps. Unbelievers at the gates restricting our access. Medieval pilgrimage wasn’t all just a happy trek through Spain in the summer. It was death-defying and life-transforming. 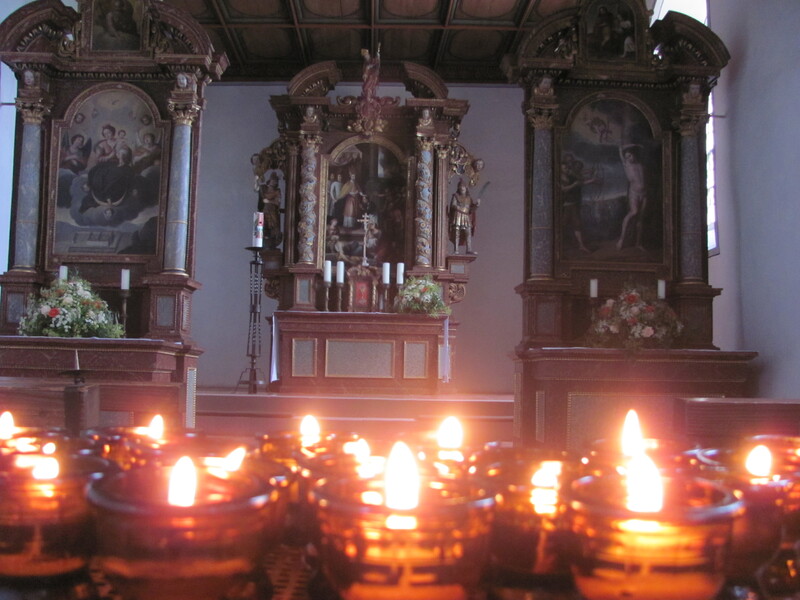 I once walked two hours of a pilgrim route in Germany, to a little pilgrims’ chapel. As I walked, I realised that, while we think of these chapels and the destinations as defining pilgrimage, there is a lot of open countryside. That’s where you meet with God. That’s where you meet with danger. So here I am, on my pilgrimage, trying to make the pilgrimage of the heart to Jerusalem in the midst of finishing up one job, taking care of a feverish and sick one-year-old, preparing to take up another job, sorting out a transatlantic move. There are dangers everywhere on this road. This is why setting in motion manageable goals of discipline is essential — prayer, Scripture, study. A great many of our ancient and medieval ascetics believed themselves to be imitating the Apostles, or living the apostolic life, or living according to the Gospel, living ‘evangelically’ (gospelly). A century after Simeon, Franciscans will make much of ‘evangelical’ poverty. This is in strong contrast with how most Protestants view asceticism. Indeed, asceticism tends to be associated with body-hating, unbiblical extremism; it is even used with such connotations by Richard Foster, author of Celebration of Discipline. Moreover, it is in contrast with how the apostles are viewed; the only disciplines usually even considered in relation to the apostles are prayer and the study of Scripture. 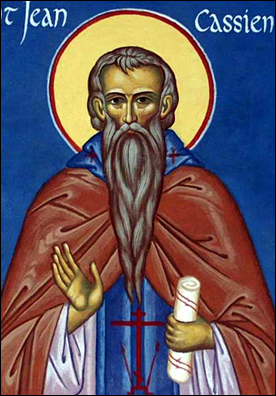 Now, what might Simeon have in mind for St Cuthbert? Certainly, as the context makes clear, prayer and preaching — these are the chief apostolic virtues of St Cuthbert’s Scots-Irish predecessors, Sts Columba and Aidan. St Cuthbert, like those two, was an evangelist before he was a bishop. He was also what one might call a prayer warrior. Of course, we might not go for his version of what continual prayer looks like. 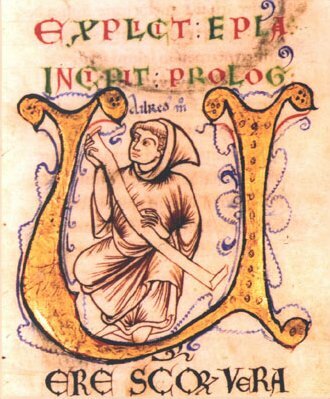 It is one thing to promote the daily office and cultivate silence, as St Cuthbert (who promoted the Rule of St Benedict amongst the monks of Lindisfarne) would have. It is another to stand in the freezing waters of the sea for an all-night vigil or to try and become a hermit. Nonetheless, there may be something to the disciplined life being ‘apostolic’. It is clear from the biblical testimony that the apostles prayed at the Jewish hours of prayer; they fasted; they renounced worldly possessions; some of them forewent the joys of marriage for their apostolic mission; they studied and prayed over Scripture. Many believe that St Paul’s time in Arabia was spent in prayer and communion with God before entering into ministry. Jesus certainly spent 40 days fasting on the cusp of his ministry. As we saw a few months ago, in fact, Bede relates the story of the Roman mission to the Anglo-Saxons, headed by Augustine at Canterbury, in terms of them living as the apostolic community did according to Acts 2. These were certainly monks. Later in the Middle Ages, it was the canons regular who claimed to be living the apostolic life. These were not, by a strict definition, monks, but clergy who lived together in community, lived a disciplined life, prayed a version of the daily office, and were active in their local communities, preaching and tending to the poor. It is worth thinking about and pondering seriously — what does the apostolic life look like? It may not look like the cloister, but does it look like the comfortable pew? The virtue of discretion/discernment is said to be the most important. Without it, monks go too far, after all — consider those, like John Chrysostom and Francis of Assisi, who end up with chronic health conditions because of extreme asceticism in their youths. I heard somewhere that Francis, for one, regretted having gone too far. On the other hand, some abuse the flexibility inherent in all communal life. Thus, ‘hospitality’ becomes an excuse for overindulgence. The extreme examples given by Cassian are about monks who almost die of thirst or starvation because of their lack of discernment. One monk converts to Judaism at the instigation of a demon disguised as an angel. In John of Ephesus’ sixth-century Lives of Eastern Monks, some monks venerate a local woman whom the demons have disguised as the Blessed Virgin Mary. Most of us are not likely to go as far as these. Nonetheless, in questions of fasting, vigils, Scripture reading, prayer routine, discernment is needed. We have the wisdom of our elders in the faith — that great Cloud of Witnesses. But each of us is different. Thus, by prayerful discernment, we can consider with the guidance of Scripture, the Fathers, and the witness of the Holy Spirit in our hearts what is the right path to holiness for our individual selves. If only most of us ever spent the time and energy involved! I will tell you a fact which may supply us with some wholesome teaching, without giving the name of the actor, lest we might be guilty of something of the same kind as the man who published abroad the sins of the brother which had been disclosed to him. When this one, who was not the laziest of young men, had gone to an old man, whom we know very well, for the sake of the profit and health of his soul, and had candidly confessed that he was troubled by carnal appetites and the spirit of fornication, fancying that he would receive from the old man’s words consolation for his efforts, and a cure for the wounds inflicted on him, the old man attacked him with the bitterest reproaches, and called him a miserable and disgraceful creature, and unworthy of the name of monk, while he could be affected by a sin and lust of this character, and instead of helping him so injured him by his reproaches that he dismissed him from his cell in a state of hopeless despair and deadly despondency. And when he, oppressed with such a sorrow, was plunged in deep thought, no longer how to cure his passion, but how to gratify his lust, the Abbot Apollos, the most skilful of the Elders, met him, and seeing by his looks and gloominess his trouble and the violence of the assault which he was secretly revolving in his heart, asked him the reason of this upset; and when he could not possibly answer the old man’s gentle inquiry, the latter perceived more and more clearly that it was not without reason that he wanted to hide in silence the cause of a gloom so deep that he could not conceal it by his looks, and so began to ask him still more earnestly the reasons for his hidden grief. And by this he was forced to confess that he was on his way to a village to take a wife, and leave the monastery and return to the world, since, as the old man had told him, he could not be a monk, if he was unable to control the desires of the flesh and to cure his passion. And then the old man smoothed him down with kindly consolation, and told him that he himself was daily tried by the same pricks of desire and lust, and that therefore he ought not to give way to despair, nor be surprised at the violence of the attack of which he would get the better not so much by zealous efforts, as by the mercy and grace of the Lord; and he begged him to put off his intention just for one day, and having implored him to return to his cell, went as fast as he could to the monastery of the above mentioned old man— and when he had drawn near to him he stretched forth his hands and prayed with tears, and said O Lord, who alone art the righteous judge and unseen Physician of secret strength and human weakness, turn the assault from the young man upon the old one, that he may learn to condescend to the weakness of sufferers, and to sympathize even in old age with the frailties of youth. And when he had ended his prayer with tears, he sees a filthy Ethiopian standing over against his cell and aiming fiery darts at him, with which he was straightway wounded, and came out of his cell and ran about here and there like a lunatic or a drunken man, and going in and out could no longer restrain himself in it, but began to hurry off in the same direction in which the young man had gone. And when Abbot Apollos saw him like a madman driven wild by the furies, he knew that the fiery dart of the devil which he had seen, had been fixed in his heart, and had by its intolerable heat wrought in him this mental aberration and confusion of the understanding; and so he came up to him and asked Whither are you hurrying, or what has made you forget the gravity of years and disturbed you in this childish way, and made you hurry about so rapidly ? And when he owing to his guilty conscience and confused by this disgraceful excitement fancied that the lust of his heart was discovered, and, as the secrets of his heart were known to the old man, did not venture to return any answer to his inquiries, Return, said he, to your cell, and at last recognize the fact that till now you have been ignored or despised by the devil, and not counted in the number of those with whom he is daily roused to fight and struggle against their efforts and earnestness—you who could not— I will not say ward off, but not even postpone for one day, a single dart of his aimed at you after so many years spent in this profession of yours. And with this the Lord has suffered you to be wounded that you may at least learn in your old age to sympathize with infirmities to which you are a stranger, and may know from your own case and experience how to condescend to the frailties of the young, though when you received a young man troubled by an attack from the devil, you did not encourage him with any consolation, but gave him up in dejection and destructive despair into the hands of the enemy, to be, as far as you were concerned, miserably destroyed by him. But the enemy would certainly never have attacked him with so fierce an onslaught, with which he has up till now scorned to attack you, unless in his jealousy at the progress he was to make, he had endeavoured to get the better of that virtue which he saw lay in his disposition, and to destroy it with his fiery darts, as he knew without the shadow of a doubt that he was the stronger, since he deemed it worth his while to attack him with such vehemence. And so learn from your own experience to sympathize with those in trouble, and never to terrify with destructive despair those who are in danger, nor harden them with severe speeches, but rather restore them with gentle and kindly consolations, and as the wise Solomon says, Spare not to deliver those who are led forth to death, and to redeem those who are to be slain, Proverbs 24:11 and after the example of our Saviour, break not the bruised reed, nor quench the smoking flax, Matthew 12:20 and ask of the Lord that grace, by means of which you yourself may faithfully learn both in deed and power to sing: the Lord has given me a learned tongue that I should know how to uphold by word him that is weary: Isaiah 50:4 for no one could bear the devices of the enemy, or extinguish or repress those carnal fires which burn with a sort of natural flame, unless God’s grace assisted our weakness, or protected and supported it. And therefore, as the reason for this salutary incident is over, by which the Lord meant to set that young man free from dangerous desires and to teach you something of the violence of their attack, and of the feeling of compassion, let us together implore Him in prayer, that He may be pleased to remove that scourge, which the Lord thought good to lay upon you for your good (for He makes sorry and cures: he strikes and his hands heal. He humbles and exalts, he kills and makes alive: he brings down to the grave and brings up ) , and may extinguish with the abundant dew of His Spirit the fiery darts of the devil, which at my desire He allowed to wound you. And although the Lord removed this temptation at a single prayer of the old man with the same speed with which He had suffered it to come upon him, yet He showed by a clear proof that a man’s faults when laid bare were not merely not to be scolded, but that the grief of one in trouble ought not to be lightly despised. And therefore never let the clumsiness or shallowness of one old man or of a few deter you and keep you back from that life-giving way, of which we spoke earlier, or from the tradition of the Elders, if our crafty enemy makes a wrongful use of their grey hairs in order to deceive younger men: but without any cloak of shame everything should be disclosed to the Elders, and remedies for wounds be faithfully received from them together with examples of life and conversation: from which we shall find like help and the same sort of result, if we try to do nothing at all on our own responsibility and judgment.